If you haven't been diving for a while then a private refresher course is an ideal way for you to increase your confidence, comfort in the water and renew underwater skills that you learned on your Open Water Course. 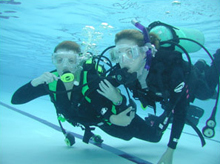 This course comprises 3 to 4 hours of training with an instructor in our specialised deep training pool going over diving and buoyancy skills.. This course is usually available on request but must be booked in advance.